This year I made fabric gift bags rather than using wrapping paper. I have quite a bit of fabric that doesn’t seem to get used, so for Christmas and Sophia’s birthday so far I’ve been making these bags. 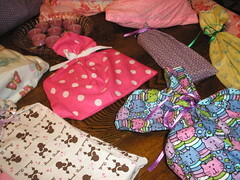 Some of the fabric I used for Sophia’s birthday bags came from clothing we no longer wore. Thought these bags would have special significance and memories. Sure enough, they were recognized right away. I also sell fabric bags in my shop (made from new fabric). Please visit my shop (Harvest Moon by Hand) at http://www.harvestmoonbyhand.etsy.com. 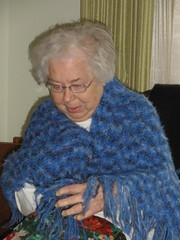 I crocheted this shawl for my mom since she is always cold. She can wear it around her shoulders when she’s sitting up and moving around. It also is long enough that she can put it over herself and use as a blanket. The yarn is incredibly soft and warm. The shawl is 125 chains long using a size K crochet hook. I double crocheted the shawl until it was wide enough to go from my shoulders to mid-back. The fringe is knotted in every other chain along the length and sides of the shawl. I did not fringe the top (along the neckline). The shawl took 5 skeins of Angel Hair yarn. I made this quilt for my dad who has Alzheimer’s Disease. 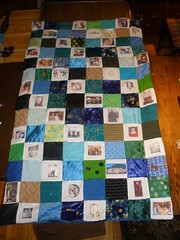 It is a sensory and memory quilt. The fabrics have different textures, and the pictures are ones that he picked out that are meaningful to him. The back is a very soft fleece. Gave it to my father today (December 27th). Was a couple days late because of the big snowstorm. Anyway…he opened the box and looked at the quilt, and immediately started recalling memories and sharing stories about some of the pictures. He cried when he looked at other pictures. “I’ve had a good life,” he said. After the girls sang in the church choir on Christmas Eve, we came home and had dinner. After dinner, they make reindeer food. This is something they look forward to doing. 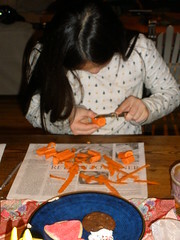 Sophia peeled and cut up carrots to put out for Santa’s reindeer. Olivia (and later Sophia) took oatmeal and added sugar sprinkles to it. The oats give the “reindeer energy to last the rest of their flight” while the sugar sprinkles give the reindeer a quick pick-me-up. The girls know not to put TOO many sprinkles in the reindeer food. Otherwise, Santa’s reindeer will have a lot of energy fast…and then have a “sugar crash.” They wouldn’t want that…so they showed some restraint with the sprinkles. 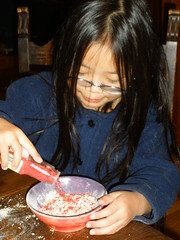 This is Olivia adding sprinkles to her bowl of reindeer food. Each year I make some homemade food items to give to others. This year, I made a cranberry salsa with cranberries, granny smith apples, fresh cilantro, jalapeno peppers, apple juice, and probably some other ingredients I’m forgetting at this moment. It’s a rather sweet salsa – yet has some punch to it thanks to the jalapeno peppers. It’s delicious with chips, or on top of cream cheese and crackers. 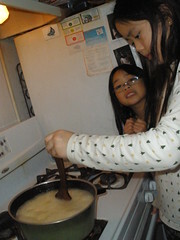 This is the first time that the girls and I have made jelly. 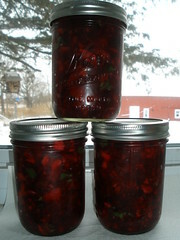 Have always made jam. Was happy that it turned out. The jelly is made with lemon zest, fresh lemon juice, and honey from the beehives in the backyard. 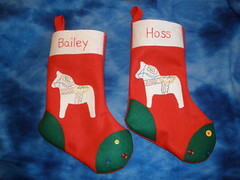 I hand-embroidered little dala horses and put them on Bailey’s and Hoss’ stockings (they are the pony and miniature horse). All of the pets have Christmas stockings. Seems like I am making stockings every year. The stockings are now all hung by the woodstove. There’s very little room left wood timbers next to the woodstove. Hopefully no more animals find their way to the farm in the next few years. Otherwise, I’ll have to think of another way to display the stockings.